Who else is gonna come here, Jim? Oh, Bill. It seems like at the end of every season we find ourselves here; wondering whether you’re the right man to break arguably the most embarrassing streak in college athletics. There is no denying it. I have been to every other arena in the B1G and have seen first hand how beautiful their arenas are. You’ve got the unbelievable arenas like The Schott, or newly renovated Crisler Arena which make Welsh-Ryan look like a local YMCA, but even the Bob Devaney Center which opened in 1976 (which by the way is complemented by a new state of the art Practice Facility and is set to be replaced by a new $180 million facility next fall) is still a nicer gym than the ‘Cats home court. The fact that Bill is still able to bring solid recruits to a program that plays in a glorified high school gym is unbelievable, given that even average mid-major schools (See 13-11 MAC team Toldeo’s gym which received a $30 million renovation in 2008) can provide a better place to play. Look at our video board for goodness’ sake!!! Maybe a few pixels missing here and there? 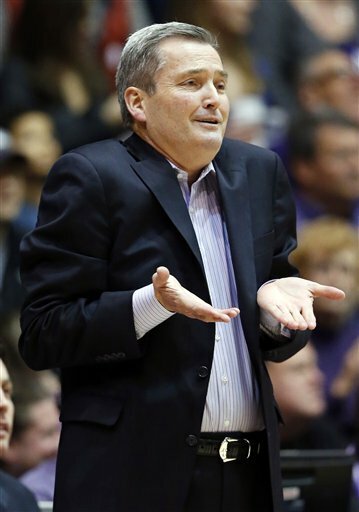 From the start of the 1969-1970 season to the beginning of Carmody’s career in Evanston (31 seasons), NU had won 6+ conference games 5 times (16.1% of the time). Bill, on the other hand, has had 6+ conference wins 6 times in 12 seasons (excluding the current season) which is half of the seasons he has coached. As terrible of a standard as it is to hope for your coach to record 6 conference wins in a season, clearly if history is a guide, he is well exceeding the program’s expectations. He has, for now, at least stabilized the program to be competitive in one of the better leagues in the country. Sure, I know it’s easy to look at what Pat Fitzgerald has done with football and think this claim is bogus. I agree to a certain extent, but in many ways that’s like comparing apples to oranges. I wont dwell on this fact too much, but hell, Bill lost a recruit with a 4.0 GPA because NU wouldn’t admit him (18-11 Villanova saw no reason not to let him in, however). Who else is going to want this job? This is a big one. In my mind, there is no way that NU could possibly hire a coach from another major conference school. There is just no circumstance in which a coach would be putting themselves in a better place to win. That being said, is NU going to be able woo someone like Brad Stevens away from Butler or Shaka Smart from VCU? NO!!! Hell, Illinois couldn’t even do that. There is no other head coach out their that would leave their post to come to NU. If you fire Bill, your two options are going to be promoting Tavaras Hardy to head coach or Hiring Mitch Henderson back from Princeton. Either way, you will basically have the same program you have right now, so why not just let Bill finish what he’s started. You get what you invest. NU hasn’t surrounded Bill with the tools to build a winning team. Hes had the worst facilities in the league year in and year out, he took over a program with absolutely no tradition what-so-ever, he is not able to recruit the best players simply due to academic standards, and there is no better person than him that would be willing to hold down his position. NU clearly has put basketball on the back burner in relation to football, and the results follow suit. If NU tears down the monstrosity that is Welsh-Ryan Arena, and builds a state of the art gym that will allow a coach to compete on the recruiting trail, then they have the ability to attract a mid-tier coach to come take Bill’s spot. They can surely give him the boot at that point, but until then, Bill’s my man.